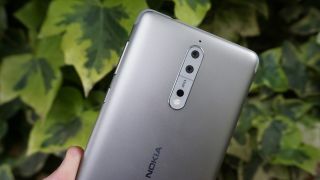 The Nokia 9 is rumored to be the next Nokia flagship, and it could arrive this year, yet we haven’t seen many images of it – until now, that is, because numerous renders of the phone have just been shared. Based on computer-aided design (CAD) files, and created by reputable leaker @OnLeaks for CompareRaja, the images show both a curved screen and a curved back, similar to the Samsung Galaxy S7 Edge. It’s not totally clear what the back of the phone is made from, but in an earlier leak it looks to be glass, while other details – all of which match what we’ve seen before – include a fingerprint scanner on the back and a dual-lens rear camera. The dimensions are apparently 140.9 x 72.9 x 7.5mm, which would make the Nokia 9 shorter than the 150.9 x 72.6 x 7.7mm Galaxy S7 Edge, suggesting the Nokia 9 might have smaller bezels above and below the display, since the screen is rumored to be the same size at 5.5 inches. However, based on earlier images it doesn’t look quite as free of bezel as the Samsung Galaxy S8. Another detail to note is that there’s no 3.5mm headphone port in these images of the Nokia 9, suggesting that, as with the likes of the Google Pixel 2 and iPhone X, you’ll have to use an adaptor or wireless headphones with the phone. There’s no news on when the Nokia 9 will launch, but given that the rumored specs include a Snapdragon 835 chipset and 4GB of RAM there’s a chance it will land before the end of the year, as while those are high-end specs now they could look dated in the face of 2018’s flagships.